We would like to offer a huge thank you to artist and supporter Lynette Amelie Merry who has kindly allowed us to use her lovely image of Southwold Huts in the snow during this festive period. 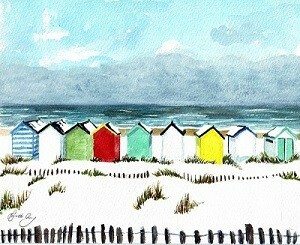 Lynette Amelie Merry is a well-established artist specialising in English seaside watercolours, including beach huts, children and stormy seaside days. Growing up in the midlands, Lynette always thoroughly enjoyed her family breaks away to places like Devon, Somerset, Wales and Great Yarmouth. Lynette also took part in the Seaside Memories campaign this summer as part of our 40th Anniversary celebrations. We asked supporters of the charity to share their seaside memories and had some fantastic responses from many of our well-known and highly esteemed supporters, including broadcaster Eamonn Holmes, author Santa Montefoire, children’s author and illustrator Chloe Inkpen and Michelin starred chef Nathan Outlaw. You can view the digital Seaside Memories scrapbook here.